Cost: $210 in the USA + import costs and duty to the UK. I have been looking around for a replacement two-speed wiper motor since I have had the car. Nearly two years later on I have still hadn’t found one that was any good. There has been the odd one in the USA on eBay that is in an unknown working condition going for daft amounts. My options were looking limited to getting the motor rewound which would have cost a fair bit, or go for a standard single speed motor that you can get virtually anywhere. Being as my car had the optional extra of the two-speed from original I wanted to keep it the same. Recently I have been speaking to Adam at Mustang Maniac who had a long conversation with me about my various options and prices. I was asked to leave my old wiper motor with him, a week later I got my phone call “Mart, I got you a two-speed motor”, that weekend I took myself down to their workshops to pick it up and have a chat. This wiper motor is not a NOS part nor a reconditioned part, this was a new(ish) product from USA. The part came from New Port Engineering, with the part called “1964 1/2 – 1968 Mustang Ford passenger car”. This part is supposed to have a three-year warranty, whether that is still applicable to the UK I’m not sure yet. This part is a bit of a trial and error process, I was willing to give it a shot as I am not intending to do concourse shows, but more a of an original resto-mod if that makes sense. The bits you can’t see will be modern-day equivalents, such as the electronic ignition, bulbs, wiring loom upgrade etc. The wiper motor hidden under the dash certainly falls into this category of mine. The box was well wrapped and the motor was pre mounted on its own single plate the same shape as the under dash mounting bracket. The rotating actuator arm was already attached via three allen screws or capped screws to the top of the motor spindle. The switch(s) came in a bag along with some screws, washers and spacers. There are two options for a standard switch with this motor. The first option is the standard two-speed black knob switch, this has a two stop movement setup and a retro style wash wipe print on the front. The second switch is the wash wipe version, the switch looks exactly the same except for the slight print change to show the washer function. 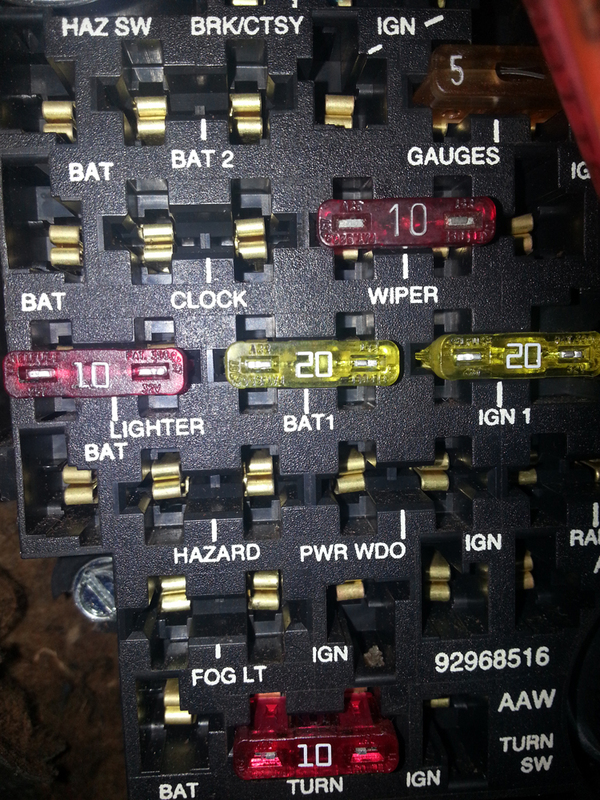 The connections on the back of the wash wipe version are in a different order to the other standard switch and has more connections of course. The wash is activated by a push in process and movement of only around three odd millimetres. The original switch is activates the wash process by pulling out the knob out from the dash about an inch or so. Also in the box is a colour printed four page document on how to remove the old motor and replace it with the new one. The document is well explained and to be honest the whole thing is quite intuitive anyway. The wiring loom for the motor is bespoke and will not plug directly into the original under dash wire loom. The original loom has seven spade connections to the back of the correct switch and this loom has four plus an earth. There is a block connect about twenty centimetres from the motor should you need to remove the motor without the hassle or removing the wires or switch, if you do split the sire apart make a note of the wires position, they do not match up with the different colour wires from the motor itself. sideview with the original arm next to the new style. The gloss black finish is very good and finished with the New Port engineering sticker attached. The wires are quite long and reach the switch with ease. The first thing to notice is the size of the original motor compared to the new style motor. The new one is smaller than the original and a little lighter as well. The wiper actuator arm is a different design to the original. The new actuator arm’s design is a single spindle on the top whereas the original motor had the pins split top and bottom in slightly different locations. The new design has the step effect for the linkage arms, the left wiper whole on the linkage being a fraction bigger than the right hand side. This obviously ensures the correct locating of the arms on the spindle. The knob on the switch is held in place on a flattened shaft held in position by a small grub screw into the plastic. Note: The instructions can be clearly seen here and I will not be repeating them, but more of a summary of the fitting points and an overview from me. There is a couple of ways to fit this motor. I would suggest that you do remove the original bracket from under the dash to mount the motor. It would make fitting a little easier than trying to fit the motor in situ as it were. But, it’s not to difficult to do it the way I had done it fitting it to the bracket in the car..
First thing is to remove the wiper arms, this may be easier said than done. I had some real issues with this and they were stuck solid. I used my Gibbs Brand lubricant and left it for a few minutes, I came back and with a large screw driver and a cloth they just popped off the spline. The fitting of the motor is the same for being on the bracket out of the car or fitting it to the bracket in the car. Obviously the latter being an issue for the tight space. But, the principles are exactly the same. Once the original motor is out there are three spacers that will sit in the rubber washers on the bracket. Keep the original washers from the old motor that have the larger hole in the middle as they will be required later. spacer in place, the rubber should it in place. Remove the actuator arm from the top of the motor with an allen key, and keep the little bolts safe. The next part was the motor to be offered up, the mounting plate fitted to the edge of the main bracket perfectly, and the top of the motor spindle fitted through the main bracket hole with only the smallest of gaps. The bracket was pretty much in position now and just need the final locating. I found the easiest way for this to be held in place was to put the screw into the rubber washer without any steel washers at this point in order to hold the motor in place at the top. The bottom fixing and the middle fixing I mounted properly, I put the larger washer on from the original motor mounting, followed by the smaller washer supplied for the bolt. The larger hole in the original washer allows for the spacer to be centrally located within the rubber washer on the main bracket. I found that here my only moan, the screws are only just long enough to reach the mounting plate with the fairly thick washers and rubber washers in place. The screws could have done with being a quarter of an inch longer. This would have allowed loose lining up of the bolt and thread onto plate. Also this would stop you having to press the motor into the rubber washer in order to get the thread started. This part took me the longest to do, once I had the two correctly spaced bolts in place I then removed the top bolt and replaced it with the washers as required. Using a small stubby spanner I tightened up the bolts to a good tension. Now came what I was expecting to be the difficult part, the wiper arm linkage. If the bracket is off the car then this particular part would be a lot easier. With the bracket fully mounted now to place the wiper arm to the top of the motor. Remove the “C” ring clip on top of the arm pin. Mounting of the arm is done via three small bolts that have to be felt into place. Starting with the middle screw I found the middle location and fiddled the movement around until it located, tightening up as much as possible by fingers, but also allowing a little movement for aligning up the other two bolts. The other two were a lot quicker as the main location was now pretty much in place. Using the allen key tighten the three bolts up. At this point the main under dash bracket will now be in place. Apply some quality grease around the pin for the arm linkages. The left hand arm will go on first as it has the fractionally bigger hole for the larger diameter pin at the bottom. I also applied a good blob of grease to the inside of the linkage mounting holes. This part was a bit tricky as I found I had to ever so slightly twist the linkage to make the arm go over correctly. The right hand side was tighter and again needed a tiny tiny twist with the pliers to allow it to seat correctly. A small tap with a screw driver on the linkage made sure the arm fully down to expose the recess at the top of the pin for the “C” clip. Then I pressed the “C” clip onto the pin and it was located and locked in place. A further application of grease should keep it all free and lubricated. As I have rewired my car completely I have a wire from my loom called “Wiper Feed”. This is a hot wire from the ignition “on” position. The red wire supplied with the switch is to be connected to a live feed and be protected by a 10amp fuse. I was able to remove the supplied main live wire and use the one from the wire kit straight to the switch. The black earth I attached to the other earth point behind my dash gauges. Next I routed the wires up to the switch and connect them to the switch as described in the supplied note. I then re-attached the battery up and placed the recommended 10amp fuse into my fuse box. Turn the ignition on and operated the switch and the wiper motor moved. Single speed, two-speed and the correct park process all worked perfectly. At this point I have not connected up my washer function in order to test. Next task was that I applied black insulation tape all around the wires and to make it look stock. That’s the job done. Only one; The moan was the supplied bolts were a little too short and mean that you have to squash the motor into place in order for the bolts to bite into the plate and try to locate the correct positioning. Perhaps a key way design for the locating of the actuator arm secured by a locking bolt would have been nice. But, the provided mounting works fine. A nice touch here was that the bag of bits had an extra of each of the smaller allen bolts and a spare washer. If you want to keep the two-speed wipers and you have a motor that has died then this could be an option you. If you want to upgrade to two speed wipers then this could be for you. This product is no way concourse correct as the original loom for the wiper motor is not used, nor is the motor marked up the same or even the same design. To keep the “stock look” of the original Mustang bezel you have purchase the optional “Switch Shaft Extension” at a further $20. I would like to have seen extension supplied with the motor. I can’t imagine for one minute anybody who owns one of these cars to use the knob on the switch supplied. The only reason this didn’t get full marks was the slightly short screws. I can imagine some people would like to use the original wiring under dash loom than the bespoke supplied one. Maybe that could be an option going forward with the block disconnect they supplied with the motor. Seem expensive but what isn’t these days. My car still has vacuum wipers & now that it is supercharged the vacuum won’t always work so I’m all for having wipers that I can rely on.